Unlocking value: The proposed transportation hub is capable of accommodating 200,000 to 300,000 commuters daily and complements the existing monorail and LRT facilities on the Pudu Jail site. KUALA LUMPUR: UDA Holdings Bhd will review the Finance Ministry’s (MoF) proposal to divide into three plots the former Pudu Jail site, better known as the Bukit Bintang City Centre (BBCC), to maximise the value of the land. Chairman Datuk Nur Jazlan Mohamed said a study on the matter was being conducted by a special committee chaired by an UDA board member. 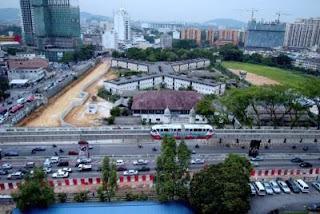 Previously, MoF had ordered UDA to divide the former Pudu jail land, or BBCC into three plots with two to be given to local bumiputra companies and the remainder to a non-bumiputra entity. The directive was issued after MoF did not consider UDA’s proposal to appoint a China’s government-linked company, Everbright International Construction Engineering Corp, as its joint-venture partner for the project. The plan involves a foreign direct investment valued at nearly RM4bil. Nur Jazlan said the special committee which reports directly to the UDA board of directors would use the model proposed by Everbright as a benchmark for any form of implementation of BBCC project. He said the proposed model would be the best solution as it gave the best return in terms of assets and recurring income to guarantee UDA’s sustainability in the future. “I understand and respect the decision made by MoF on the basis of giving priority to bumiputras and UDA as a bumiputra company would never marginalise the agenda. “Therefore, we believe the implementation of the development cannot be done hastily and in-depth study should be conducted to meet the needs of UDA and MoF as the main shareholders of the company,” Nur Jazlan said. He said the planning for the development of the 20-acre had to be made carefully and without haste because the survival of UDA and almost 1,400 of its employees depended on its successful implementation. UDA also said its transport consultant indicated that the site was suitable for a transportation hub. Therefore, a a big bus terminal and other properties in BBCC would be built around the transportation hub. Nur Jazlan said the proposed transportation hub would be able to accommodate 200,000 to 300,000 commuters daily and complemented the existing monorail and LRT facilities on the Pudu Jail site. The transport hub would also help to ease vehicle congestion in Kuala Lumpur’s golden triangle area. KUALA LUMPUR: UDA Holdings Bhd will be reviewing the proposal by Ministry of Finance (MoF) to divide the former Pudu Jail site, better known as Bukit Bintang City Centre (BBCC) into three plots, to ensure the value of the land can be maximised. UDA chairman Datuk Nur Jaz-lan Mohamed said the study is being conducted by a special committee chaired by a board member before it is presented to MoF for consideration. He said the development of the 20 acres has to be made carefully and without haste because UDA's survival and almost 1,400 of its employees depends on its successful implementation. "For UDA, this development marks the continuation of the company's survival for the future, and the board of directors has agreed that any form of development needs to prioritise UDA's interest first," Nur Jazlan said in a statement yesterday. It was reported that the MoF had asked UDA to divide the former Pudu Jail land into three plots with two being given to Bumiputera companies and the remainder to a non-Bumi entity. The directive was issued after the MoF did not consider UDA's proposal to appoint a China government-linked company, Everbright International Construction Engineering Corporation, as its joint venture partner for the land. PETALING JAYA: The recent snag that hit the projects of two property developer giants, Mah Sing Group Bhd and SP Setia Bhd highlights a new risk faced the sector in terms of landbanking activities. On Tuesday, both SP Setia and Mah Sing separately announced that they might not successful in acquiring the targeted land parcels. RHB Research believes that this could be due to the deals getting unattractive to the landowners who expected land value to further appreciate going forward. “In SP Setia case, Guan Hin Realty, the vendor of a 1,010.5-acre in Beranang, has not agreed to an extension of the period for the fulfillment of the conditions precedent (CP) which include the requirement for the approval of the Estate Land Board for the sale and transfer of the land to the developer. SP Setia, as a result, is currently seeking legal advice,” it said in a report yesterday. The land was purchased at RM330mil or RM7.50 per sq ft in August. The development of the land, which will be named Setia Emas, is estimated to yield a gross development value of RM3.5bil. “While we will not know the outcome of the tussle' yet, we highlight that if SP Setia is unable to win the case, our RNAV (revised net asset value)/share estimate will be eroded by 9.1 sen from the current RM4.15, after excluding the contribution of Setia Emas,” said the research house. RHB Research said a second parcel in Beranang was acquired from Spektrum Megah, an unrelated party of Guan Hin Realty. “Given that the acquisition price was higher at RM13 per sq ft, we think SP Setia should not have the same problem in completing the acquisition,” it said. In the case of Mah Sing, it has encountered a snag in their 60:40 joint-venture (JV) agreement with Asie Sdn Bhd and Usaha Nusantara Sdn Bhd over the 4.08-acre acquisition at Pekeliling. The vendors have taken the position that the JV agreement had lapsed on Dec 2 given that certain CP in it were not met. Under the JV agreement, Mah Sing is to undertake a RM900mil mixed development on the Pekeliling land. Hong Leong Investment Bank said while details were sketchy at this juncture, it believed the hiccup could be legal in nature than commercial. “Timeline is also an uncertainty given that their JV agreement with the vendor has previously been delayed. “However, even if the JV were to be called off, we believe impact would be minimal, given their diligent landbanking activities, it said. Moreover, Mah Sing had enjoyed a record-setting year in sales, having hit RM2bil sales in October,” it said in a report. The Pangkor Island skyline is set to undergo major changes following plans to develop a 121ha piece of idle land in Teluk Segadas into a tourist hub. Mentri Besar Datuk Seri Dr Zambry Abdul Kadir said the project would consist of houses, which tourists could invest in, as well as boarding houses. “There will be mixed development on the piece of land, which has been left idle for some 20 years now,” he told reporters after a working visit to the island recently. Noting that the developer had recently met with him to discuss its plans for the site, Dr Zambry explained that the developer had been holding on to the piece of land due to lack of funding. “Now that this has been settled, it is all systems go,” he said. On another matter, Dr Zambry said the state would be setting up additional fishing villages on the island to accommodate its second generation of fishermen. “Under Budget 2012, the Federal Government had allocated RM20mil for the purpose. “We are in the process of identifying which are the suitable locations on the island to develop these villages,” he said, adding that fishing villages on the island were located at Teluk Gedong and at the end of Sungai Pinang Kecil, at present. Dr Zambry also told reporters that the state Public Works Department had been tasked with ensuring public projects were delivered on time. Citing the island’s RM70mil police station as an example, he said work had been delayed for several months due to a change in contractors. “I want to see the project completed within the 18-month contract period,” he said, adding that the SM Pangkor hall was also being delayed. SHAH ALAM: The Selangor state government has applauded I-Bhd for successfully roping in a China company to invest in Selangor. Mentri Besar Tan Sri Khalid Ibrahim said the state was very supportive of any investment into Selangor and would help to facilitate the investment between I-Bhd and Everbright International Construction Engineering Corp (EICEC) from China. Both companies had on early this week inked an agreement to co-develop the remaining 30 acres in i-City, Shah Alam. “The cooperation augurs well for the development of i-City and also to the people in Selangor,” he said during a briefing by I-Bhd regarding the cooperation with its Chinese counterpart yesterday. The briefing was carried out by group chief executive officer Datuk Eu Hong Chew. Khalid was hoping to see more investment coming into the state and said that this year, about RM1.5bil worth of investments were recorded for the state. The cooperation between the two companies would see Everbright holding a 70% stake in the deal while the remaining would be held by I-Bhd. Under the agreement, Everbright would finance the entire construction and lead a consortium of China-based companies to set up operations in i-City, while I-Bhd would be responsible for providing the land, as well as ensuring that the subsequent development would continue to be certified as an MSC Malaysia Cybercentre and a tourism destination. Everbright chairman and chief executive officer Zhang Huaipu said during the briefing that Everbright was seeking more investment opportunities in Malaysia and also would help to attract more Chinese companies to invest in Selangor. He also said the group would help to woo more Chinese tourists to i-City. The mix development on the 30 acre site would be undertaken in two phases, involving 14 acres of land taken up for the initial phase and the balance in the subsequent phase. The total gross development value of the entire project is tagged at RM3.5bil and expected to be completed in 2020. PETALING JAYA: Mithril Bhd is selling off 29 parcels of commercial office space in Menara MAA, Kota Kinabalu for RM43.2mil to repay its redeemable convertible secured loan stock (RCSLS). Mithril is compelled to repay in full the outstanding amounts owing to the RCSLS holders. In its filing with Bursa Malaysia, the company said the sale was “paramount to avoid an event of default under the terms of the trust deed and deeds of assignment of the RCSLS”. The proposed disposal is expected to result in a consolidated after-tax loss on disposal of RM5.3mil and represents a discount of about 10.9% on the market value of the properties.